I’m trying | carpe diem! My husband would say so. But what I mean is that I should post more often. 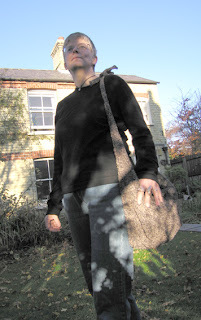 All across knitting blogland people are saying the same thing, so it’s contagious or seasonal. Knitting gifts takes time. And bits of that cold are still, STILL lingering. I’ve had a mild sore throat for three weeks now, and at the gym or Pilates all my energy runs away, like water down a drain, about 45 minutes into the session leaving me cold, breathless and struggling just as we approach the most strenuous bit of the workout. It’s better than it was, though. I keep telling myself that. These are gift socks for someone with smaller feet than mine, so my hand does the modelling to show the River Rapids lace pattern from Sockbug. 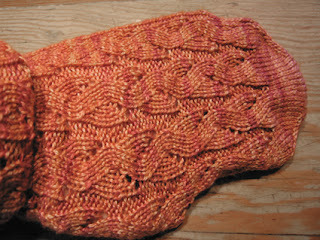 Copper Rose merino/tencel sock yarn from the Woolen Rabbit, toe-up on 2mm needles. The lace pattern is both easily memorised and easily worked out from what you’ve already knitted, so this is an ideal travelling sock pattern. I used it yesterday as a carry-all for spinning night. The plastic bag visible above contains the fibre shown here, spread over what I laughably think of as a desk. That’s the stuff I was spinning as I sat by the sea in Scotland in July. I haven’t had the heart to spin more of it yet, but I decided to at least find out if the singles were what I’d intended. That’s a UK 5p, which is roughly the same size as a US dime. 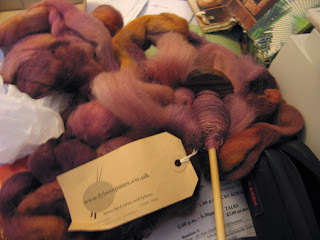 Looking at the photo now I feel justified in mentioning that the singles on the spindle are about the same thickness as those in the mini-skein, they just look larger because they’re closer to the camera! 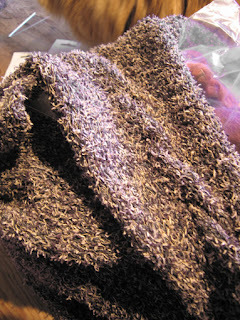 The skeins have been washed and prepped, and I’ll knit samples from them later. The 2-py is as near as anything the 2-ply that I dreamed of making from this fibre, which will be something warm and lacy. I hadn’t thought of using the singles, but they’re surprisingly even and I’ve just read a comment that a singles may work very well in lace as the twist is often controlled by the combination of different stitch types. So I’ll see what that looks like. What interested me most was the way in which these two skeins show how the twist of the singles is partly undone by plying: the 2-ply is beautifully soft and loose. Important lesson learned! I’m being reminded of another lesson even as I type: stuff I don’t want to do takes longer to accomplish. Most of my interpretive work deals with sites of natural history or archaeological interest, but an acquaintance persuaded me (aka twisted both my arms) to produce some panels about a WWII airfield. The airfield itself is scarcely visible today, having been sold as farmland in the early 1960s, but many of the buildings associated with it survive in the surrounding countryside and the village wants to be sure residents understand this bit of their history. Now, I knew a little about Britain and WWII but not enough to draft anything explaining the significance of this particular airfield, so I’ve been researching it. Britain was not ready for a war in the air in 1939: they’d only realised Germany was a threat in the early 1930s; prior to that they were preparing to fight France. Again. This was one of many airfields hastily constructed in 1940, where those who’d learnt to fly – in 10 weeks – were taught to fly bombers. And here’s where my nebulous general reluctance begins to crystallise, because I now know that the type-written text of the original displays glossed over the facts of WWII. “Bomber Command suffered the heaviest losses of any British unit in the Second World War. Roughly 12,000 aircraft were lost and 55,500 aircrew died: almost 60% of all those who served were killed.” Six out of every ten of the smiling faces in the photographs I’ve been leafing through. I can’t gloss over this, and I can’t forget it. In my draft the quoted text sits baldly under a photo of young men (and a few young women) in the airfield News Room. And, as I struggle to sort out the rest of the panels, I find myself thinking how different this world might have been if so many young men – of any nationality – with ideals and a clear sense of right and wrong had not died in the two Great Wars. This entry was posted in Uncategorized on November 21, 2007 by sarahw. After watching the DVD of ‘The History Boys’ last weekend I discovered too that I have a strong interest in ‘subjunctive history’ i.e. the ‘what if’s’!My recently finished River Rapids are on MY feet but yours are in such a fantastic shade! I always wish for peace, but I’m also sincerely grateful to the many brave Allied soldiers who fought WWII. So many people died needlessly at the hands of the German killing machine. Even as we mourn the loss of a soldier,in the case of WWII, the Allied fighting, at least in my view, was most just, brave, and courageous thing to be done. On a much lighter note, I love the socks! 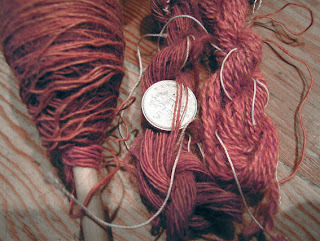 The color is so rich–and the handspun will be beautiful lace one day, I hope! Why, Sarah! How tall you are and what beautiful spinning and socks!I am confident in your ability to produce a suitable piece on the airfield and the lives of the people associated with it. It is hard to post as often this time of year, especially with the two new cats, but knowing everyone else is experiencing the same thing is a comfort at least.Your work on this WWII airfield will honor those who died, and keep their memories alive for a generation that perhaps might not have known about them otherwise. What a wonderful thing to do. What form are the interpretive panels going to be in? Are they to be plaques, photographic boards on plinths or – let’s be really outrageous – a tapestry? Any of these will be wonderful, I’m sure. I can see that regardless of the form it’s going to be a difficult subject to do justice to truth, bereavement and courage.